I'm very happy about the collected editions coming up. My library is in sore need of TMNT comics, and I will be a happy camper when I can fill my teens requests for editions we can shelf! WOOOT! 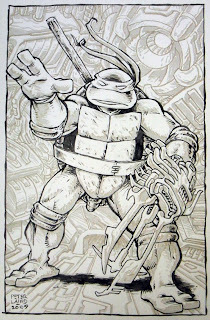 Very awesome, and this is what I miss you drawing the TMNT. p.s. I really hope you change your mind and come to the San Diego comicn I'm moving out to California right before the event and I have a gift for all of the mirage crew and would like to give them to you guys in person but I'll understand if your not up for the trip I can always send it to mirage. Sweet. I am looking forward to the collected editions. But, pardon my ignorance, but what does "tipped in" mean? Och well, I guess making new paragraphs doesn't work when i'm on my new toy - am writing this on me blackberry..
Also, I meant to ask, are you at all a Doctor Who fan? I remember a post with the Fugitoid running through a svrapyard, and there was a robot from Doctor Who there.. I just ordered some recent tpbs from panel to panel yesterday. I'm guessing this will be a tipped in book plate for some future tpb that hasn't been announced yet? That's pretty darned awesome! I take it that this is the panel to panel exclusive for the collected issues 1-11?" I think so. I gotta few books from them on order at the moment, can't wait to get 'em! They bookplates are great.. Is it just me or is the background there rather Kirbyesque? Michael Tough"
I meant to ask, are you at all a Doctor Who fan? I remember a post with the Fugitoid running through a svrapyard, and there was a robot from Doctor Who there.."
Nice work. How did you do the tones? Via computer? Ink? I'd like to try your technique myself. Nice work. How did you do the tones? Via computer? Ink? I'd like to try your technique myself." I hope it's not an erroneous entry at least... and if not, I wonder if I'd be able to get a commission...?! -->> ..no it's gonna be a toss - up decision. buying this from the local shop .. ( the collected book ) or buying the P2P version. Pre-ordered mine before I even knew the bookplate was coming! This just sweetens the deal :) Thank you, Mr. Laird, on behalf of TMNT fans everywhere. I hope it's not an erroneous entry at least... and if not, I wonder if I'd be able to get a commission...?!" Ha ha ha! I searched google for Graphics duo-shade board and guess what link popped up? Palblog! I'm sorry to hear you won't be attending, I had hoped to finally be able to meet you. Perhaps best if someone contacts the organisers to remove your name then. Will all the other Mirage guys be present? I'm disappointed -- Comic-Con's listing had me all excited. Any chance you can be bribed? Mica, i'm not sure what 'Tipped-in bookplate' actually means, far as I can tell, its a wee card print of limited numbers which have been signed by various TMNT folks.. Very nice, i've gotten myself all they panel to panel ones to date! "I am a "Doctor Who" fan, though I haven't seen much of the new series. I really liked Tom Baker as the Doctor -- he was my favorite of all of them. -- PL"
First of all, I love the artwork for the P2P edition. I think I'm going to pick one of these books up. Second, I'm also disappointed to hear that you won't be attending SDCC, Peter. I saw your name listed on the Comic Con magazine along with the rest of the Mirage crew and got uber excited... Very sad news. I was really hoping to get the chance to finally meet you. DARN! I was all set to meet you! I am sorry to hear that you aren't coming after all-- I trust that the rest of the listings in Artist's Alley are correct, and the others will be there-- but it would have been SWEET to meet you in person. I'm not sure where you saw my name listed as appearing at this year's San Diego Comicon, but it is an inaccurate listing -- I am not planning to go. -- PL***Oh, that is saddening to hear. I'm traveling to SDCC from Western Australia, specifically for the 25th anniversary of the TMNT, and I was hoping to have the opportunity to meet you. But if it cannot be, it cannot be. Emma, great to see another Aussie going! I remember there was a place in Sandy that actually has Timtams for sale there. I laughed my arse off when I saw the price though. 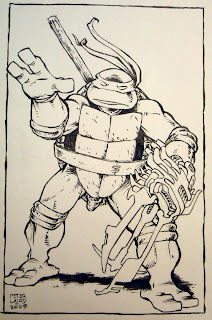 I am currently working on artwork for my comic and would love to emulate the look of the DuoShade boards that you guys used for the Turtles digitally (in Photoshop or Illustrator). I've seen a few (by that I mean one and some random posts) "tutorials" online but I haven't been satisfied with the results. Does anyone know of a good tutorial on how to do this or have experience with it? I simply love the way the old B&W Turtle books looked and would love to experiment with something similar as my book will also be B&W. Thanks to any and all who can help.